Leaving the small community of Bedizzano, Italy, into the direction of Colonnato, the road winds itself up in hairpin bends into the Apuan Alps, a mountain range in northern Tuscany. At the third bend there is a side road that is flanked by numerous sculptures, as shown in above and below screenprints (September 2016, Streetview). This spot is locally known as Mortarola. The series of sculptures, scattered along the road, was created by Mario del Sarto, who.was born in 1925 in a rural family. Already at the age of eight after school he helped his father, who was a shepherd in the area of the Apuan Alps. De Sarto himself for many years worked as a carpenter, until he could get a job at the Ferrovia marmifera di Carrara, the railroad built between 1876 and 1890, that was used to transport marble blocks from the mountains of the Apuan Alps to the the Mediterranean sea nearby the community of Carrara, a 22-kilometer track that ran over many bridges. It was disbanded in 1964. In the 1970's, when de Sarto was in his mid forties, without any artistic training he became active as a sculptor, first in the field of woodworking, later in making sculptures, mainly using the the blocks of white marble that he previously transported by train and which made Carrara so famous. 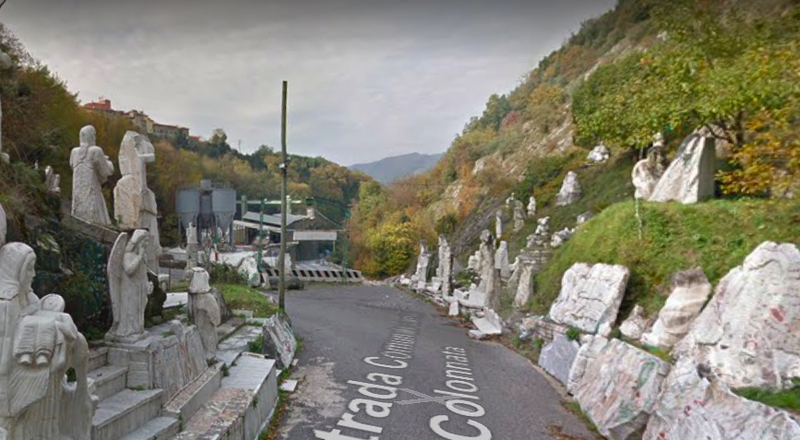 He had his workshop and living house along the aforementioned Strada Comunale Carriona di Colonnato and gradually the sides of that street became filled with the many creations he made. About his way of working he said that he lets the marble speak for itself. When he starts working, he has no models in mind, not even in his imagination, so, as he said: "The figures must appear themselves, as if by magic". For his sculptures he uses either marble that naturally comes out of the mountain or remnants that remain after the processing of marble blocks..His sculptures often have a historical or biblical background. A great work with a historical impact is the one called La fontana del sapere (The fountain of knowledge), a combination of well known characters and memorials from the area, such as the locomotives and the route of the marble railway, as well as the work of the miners. Started in the 1970's, del Sarto, who currenty is in his nineties but on the video below still has a lively appearance, meanwhile has enriched the place where he lives with hundreds of sculptures, stand alone or united in ensembles. It is one large open air museum. 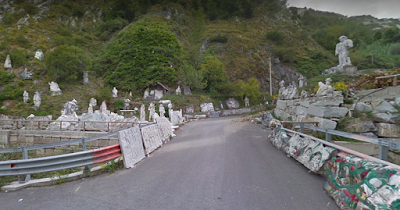 The area around this site has been hit several times by floods, which in particular have caused damage to the sculptures stored at the rear of del Sarto's workshop. 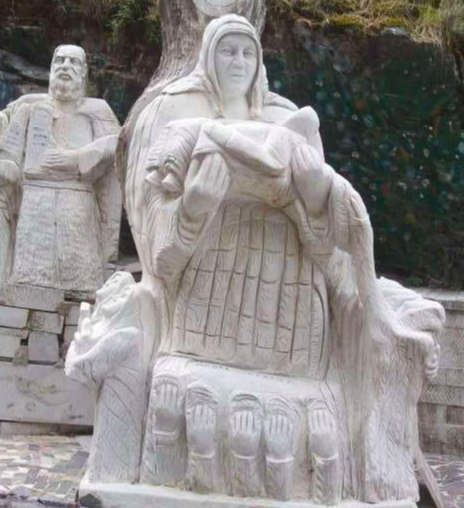 But these natural disasters have not erased the great impression made by the creations that are still on display. 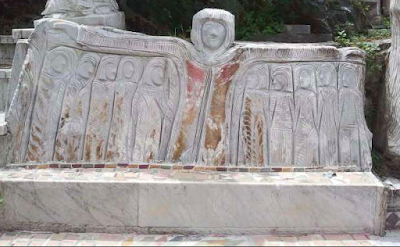 Sculptures by Del Sarto are also found elsewhere in Italy, like there is a work located near the cemetery of San Giuliano in Puglia that evokes the memory of the earthquake in that place in 2002, that killed 27 children in a kindergarten. This art environment, located on the side of his house, has been created by Renato Mancini who was born in Massa Lombarda in 1954. When at age twenty he was in military service, he saw a sculpture of scrap iron depicting a rider on a horse that deeply impressed him. So once he had completed his military service, in 1976, he started to make this kind of sculptures himself, using a variety of recycled metal and scrap iron items. 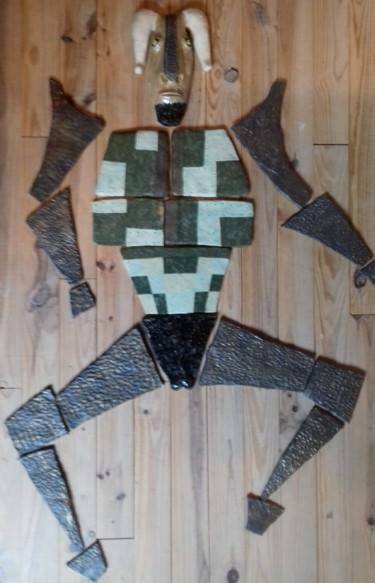 He worked as a carpenter and maintenance worker at local companies, which gave him the opportunity to collect iron waste remaining in the production processes performed by the companies he worked for. 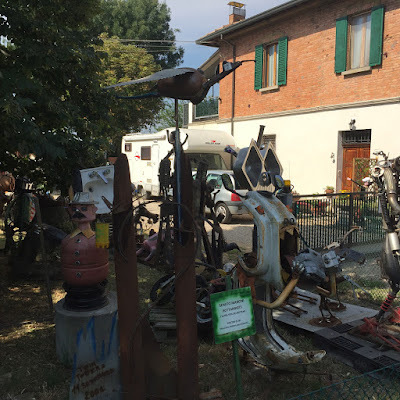 Over time, Mancini has produced an extensive range of iron sculptures, some of which are preserved indoors and some of which are set up in the garden in front of his house. Mancini's artwork in general has a realistic slant. 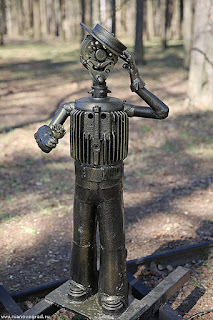 On his personal website he says: "The objects themselves, through their form, suggest to me what they want to become. 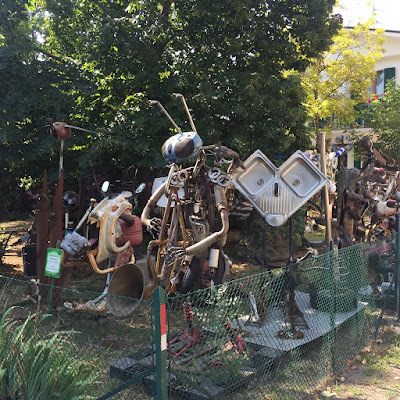 That's how the constant collecting of recycled materials, particularly scrap iron and similar waste, has become a major part of my research and artistic work. The fact that 100% of the materials that I use are recycled is fundamental for me". The large quantity and the diversity of the works created by Mancini so far, bears witness to the great imagination, inventiveness and passion he possesses as an artist. Above replica of the Eiffel Tower made from welded iron bolts and nuts, is part of an ensemble of scrap metal sculptures that in 2013 was installed in a park in Ivanovo, a city in Russia, some 250 km north-east of Moscow. This ensemble has been created by Vladimir Volkov, who was born in 1965 and by profession is a technician working at Ivanov's Radio and TV Company. 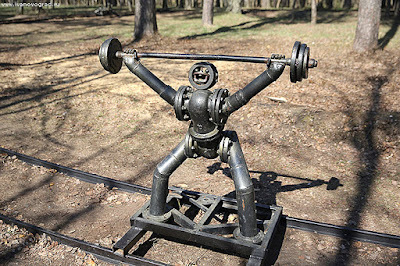 In his free time Volkov likes to make all kinds of iron sculptures, that he assembles by welding pieces of scrap metal together, a hobby that started when he was in military service and saw a sculpture made from scrap metal on a street in Kiev. At home he has a collection of mostly small-scale iron sculptures, depicting female characters, animals like a bird or a dog, and various other creations from iron including utensils such as a standard for a lamp. 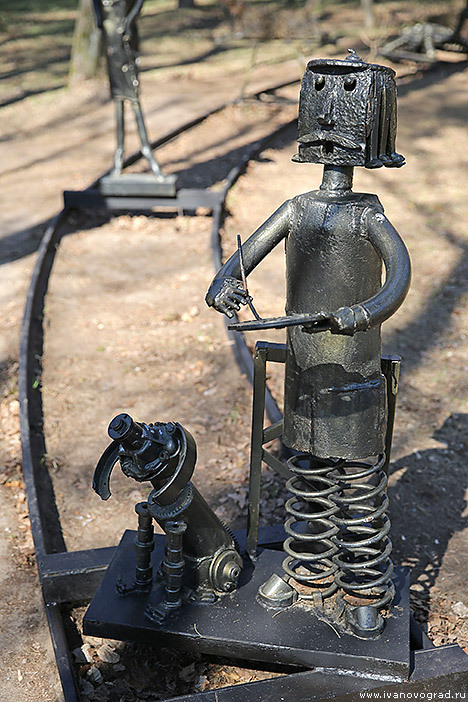 Before the ensemble was installed in the park Volkov already had made several large-scale sculptures that got a place in Ivanovo's public space, like an older man seated on a bench with a dog at his feet (on Arseny street), a skateboarder (in front of the building of the Radio/TV company), and a tribute to Nikolai Benardos, who discovered arc welding (on Lenin Avenue, near a former factory). 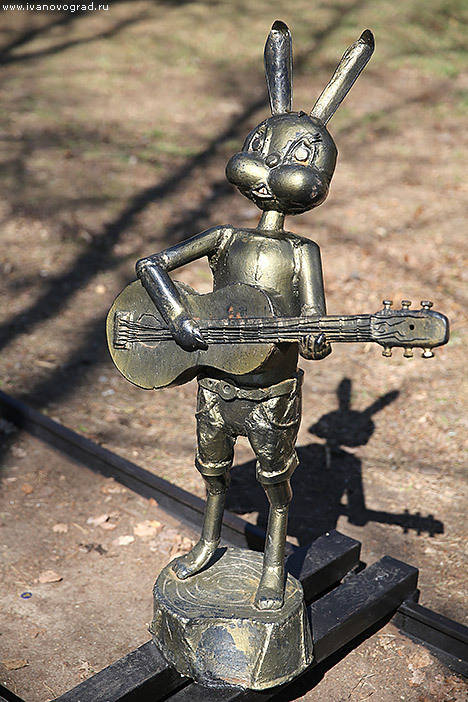 There is also a sculpture (at Teatralnaya Street, near a medical polyclinic for children) that represents a wolf holding up an adopted calf, a scene that refers to a Soviet-period animation film that's well-known in Russia. 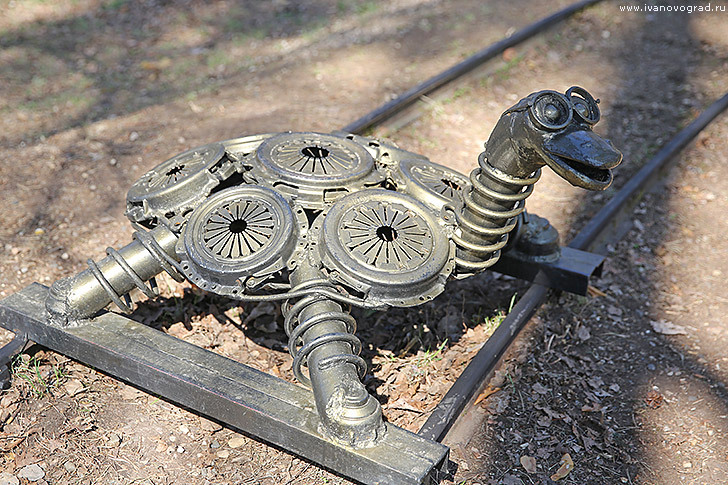 At the opening of the ensemble in the Stepanova park on 29 June 2013, it had a size of five sculptures, which were mounted on the still existing rails of a former train for children. The number has gradually increased and currently there are some thirteen sculptures. The components of these sculptures can be recognized, easily with regard to the painter and his dog (right above) where the legs are spiral springs, a bit more more difficult with regard to the lady (left above) with a dress made from an elongated narrow barrel, kind of an exhaust, and a head made of a headlight of a car. As can be seen on the video below (starting at 2'05"), early 2018 in a public meeting Volkov got Public Recognition for his for his contribution to the cultural development of the city. Located in the small community of Lohrheim, Germany, some 70 km north-west of Frankfurt am Main, above pictured house is home to an art environment in the capacity of a museum, named INITIUM ET FINIS (Beginning and end). As a further indication the complement Wunderkammer der Humanität (Wunderkammer of Humanity) is often added. Matthias Korb was born in 1969 in Frankfurt am Main. Already at a young age he was concerned with man and his place in the system of nature and how that was expressed, for example, in the way gardens were laid out in the Renaissance compared to the contemporary way of working. By this interest he was inspired to look for a job in the field of landscape gardening. In his late twenties, in 1997, he started his own business in this area. With the same interest in mind, for a number of years Korb was also involved in publishing books, while in 2005, without any education at an art school, he started to focus on the creation of visual art. 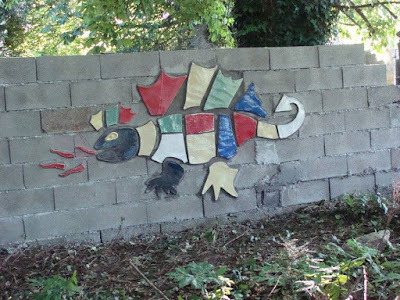 pictures, where found objects get a new meaning and nature appears in the background decoration that can consist of a mixture of paint and different forms of earth. There also is a relation with his job as landscaper in so far the way he arranges his assemblages corresponds to the way he designs a garden with lines, colors and forms. 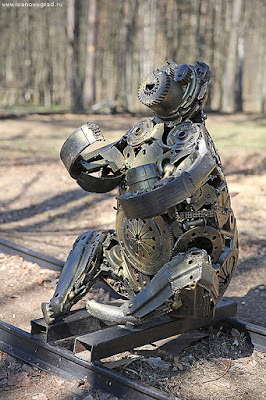 A self-taught artist, Korb already has participated in various expositions in Germany. 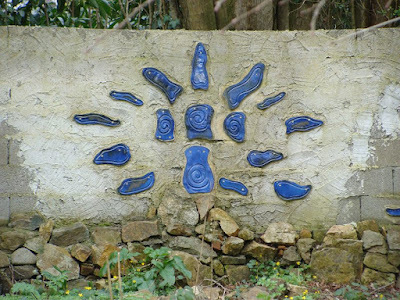 In 2008 Korb added another approach to his artistic activities, when he started to transform the house in Lohrheim into an art environment. 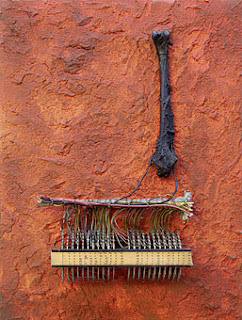 Conceptually this art environment is an overwhelming collection of objects, attached to walls, displayed in 19th-century wall cabinets, sometimes arranged in a horizontal arrangement, but often seemingly randomly placed, all the things that surrounded mankind or were made or used to go through life. In a review of the museum art historian Sophia Rasmussen used a classification from the time of the classics to describe the collection. * Devotionalia (devotional items) such as crucifixes, statues of saints, votive images. All items have been gathered by Korb himself. He found many items just by by chance, in nature, during his work, on the dump, but mostly at flea markets in Frankfurt, a town where he often comes because of his work. But he would also search consciously for specific items if they would fit in with the concept of an assemblage he had in mind to make. Some of the rooms in the house have been transformed into salons with dark red painted walls. Such a salon may be equipped with black painted furniture and wall cupboards which give the room a 19th century look, Smaller items, such as framed photos on the wall, reinforce this allure. The barn covers the largest part of the collection. 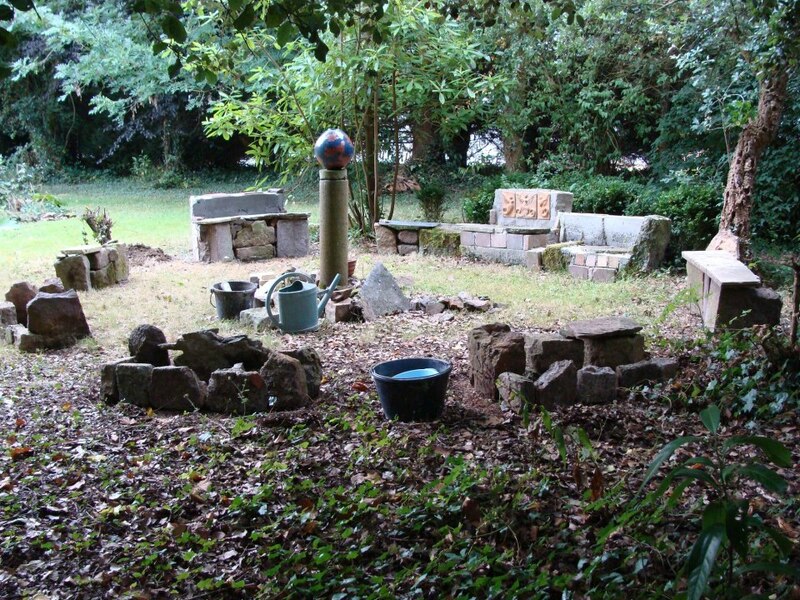 It also includes Korb's studio and the artworks he has created in the course of the years. The garden is intended as a place to rest after a visit to the museum and to consider one's experiences. There is an assembly of glass bottles that portrays the periodic table of elements, just the tangible parts of course. Maybe a reference to the inevitable fact that a collection like this never can be complete. As said, the museum is also indicated as a Wunderkammer der Humanität. The German concept Wunderkammer (Room of wonders) refers to a phenomenon from earlier centuries, when collections were set up -initially by royal people, later also by rich civilians- which included artworks, but also miraculous and everyday things. From these wunderkammer the art museums of our time would develop, some with a wide collection, as goes for many national museums, others with a specific collection that focuses upon a specific artist, art direction or historical period. Other than joining this process of ongoing specialization, the Museum Initium et Finis bears witness to a development that is going in a completely opposite direction, that of generalization. However, the use of the Wunderkammer concept is not intended to give shape to longing back to the past. This art environment is a Gesamtkunstwerk ¹ that -using the Wunderkammer concept- investigates the relationship between mankind and all that it surrounds. times. 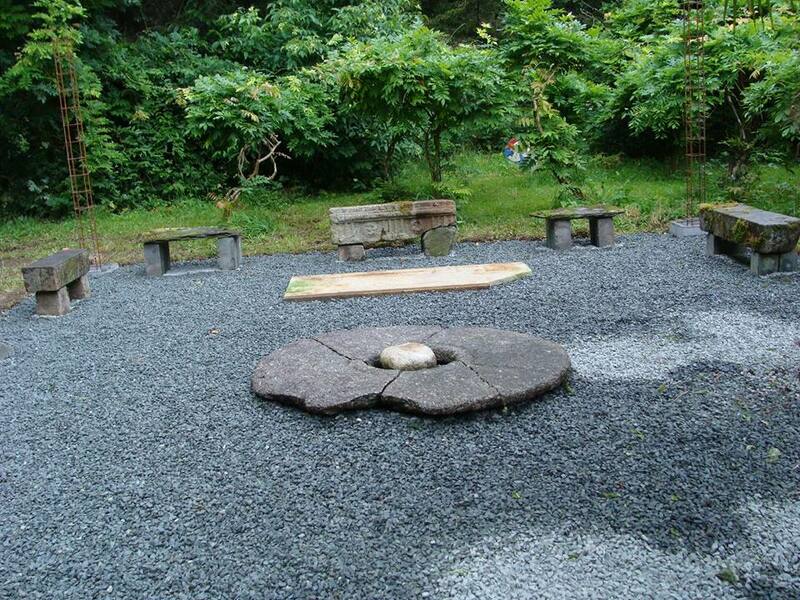 In good weather the garden of the museum offers the visitor a suitable place to reflect about this. ¹ A Gesamtkunstwerk is a concept that originated in German art history during Romanticism, suggesting an interplay of arts, initially especially in architecture. Bogosav Živković (1920-2005) was born in a poor family in Leskovac, a community in Serbia, some fifty kilometers south of its capital Belgrade. He worked as a farmhand and as a leather worker. 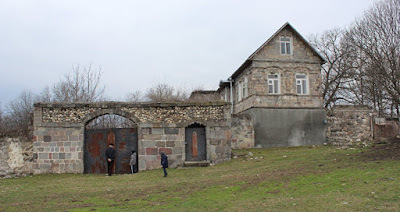 When in 1941, at the beginning of the Second World War, Serbia was occupied by Germany, parts of the country had to suffer from cruel treatments of the occupying forces and as a young man Živković was seriously traumatized by a malicious treatment by German occupiers. This trauma would stay with him all his life. It also made him decide in 1945 at age 25, to leave his job as a leather worker and move to Belgrade, where he found a job as a porter. 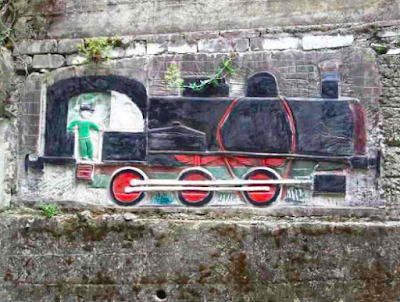 Living in Belgrade, in the mid 1950's Živković began feeling attracted to making visual art. 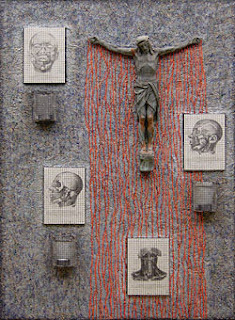 His development as a self-taught artist has often been associated with the traumas he had sustained in the beginning of the war. What he saw and experienced in restless dreams and troubled nightmares was at the basis of his creations. 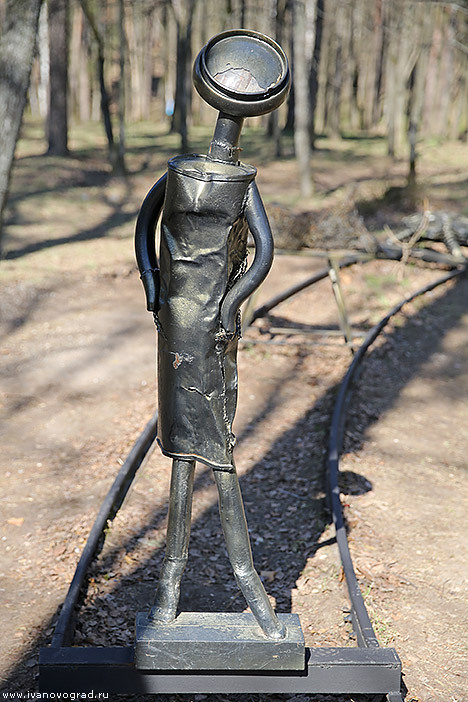 Živković made his first sculpture in 1957. Already in 1960 he had his first independent exhibition and soon he was seen in Serbia as an important artist in naive and marginal art. During his life he had exhibitions in many European countries and his work was bought by various European museums in the field of naive and marginal art. 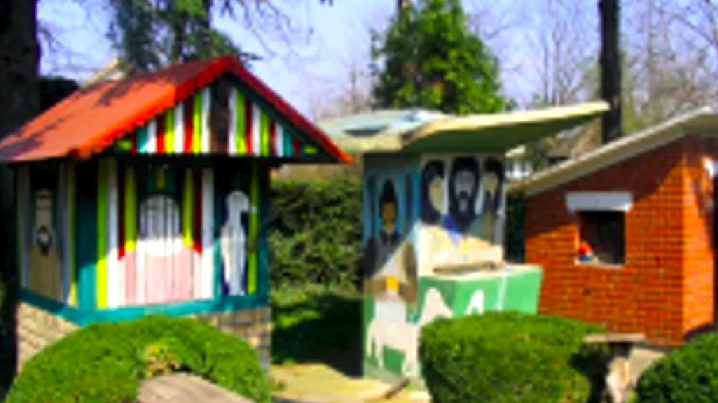 The Museum of Naive and Marginal Art in Jagodina, Serbia, has an important collection of his works. In the late 1960’s Živković returned to his birthplace Leskovac. He was now married and in 1965 had finished his job as a porter. With his wife Dobrita he went to live in the house where he was born. On the premises of this house, a simple structure built in the early years of the 20th century, there are also a few other buildings, such as a barn of some 5 x 3 meter -built before 1940- that was used as a winery and some other small buildings named after the way they have been decorated, such as the house with a sun, where Živković had his studio, and the house with a face. Other smaller items and structures also gave the garden its own character, such as two bread ovens, an outdoor dining room, a fountain and a stone composition for sitting. 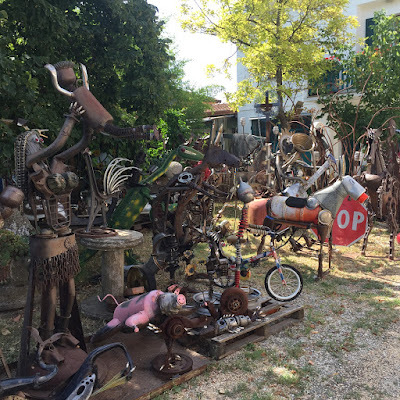 All these elements are part of the almost 100 m² large garden of the property, which Živković together with his wife, in the 1970's began to transform into an art environment. 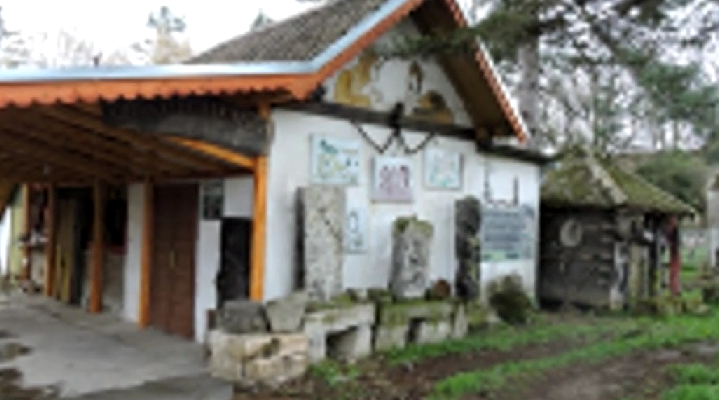 Živković himself indicated the site as Museum of Folk Art "Golden Branch", but generally it has become known as Magic Garden. 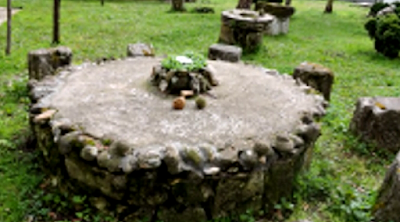 Dobrita Živković took care of the landscaping of the site, adding flowers and plants, including lushly growing ivy that especially would appeal to visitors. 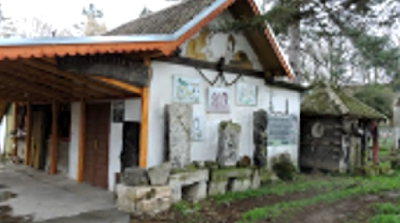 It has been noted that although the various buildings in the garden each have no specific artistic significance, the site as a whole during Živković’s life had a pleasant, atmospheric and valuable artistic appearance. 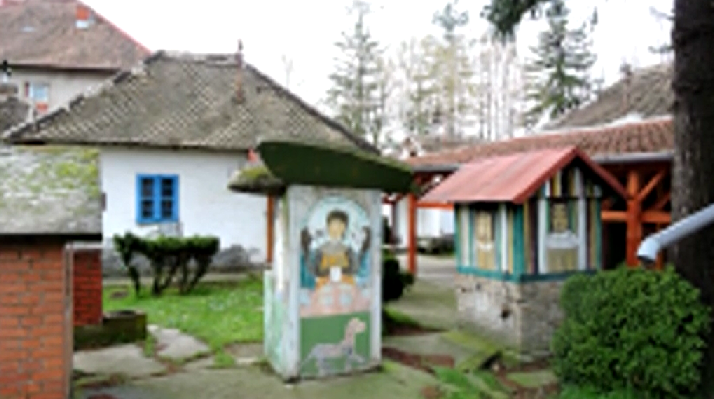 During Živković’s life the Magic Garden gained a good reputation and attracted all kinds of visitors, including high-ranking guests of Yugoslavia or Serbia, such as emperor Hirohito of Japan, emperor Haile Selassie of Ethiopia and president Jimmy Carter of the United States. 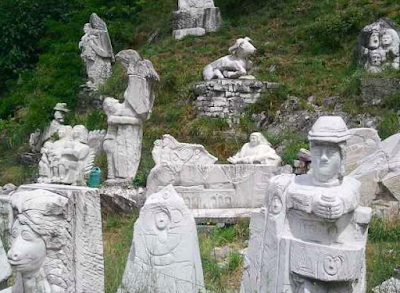 After Bogosav Živković in 2005 had died, a period of uncertainty began regarding the further development of the site. 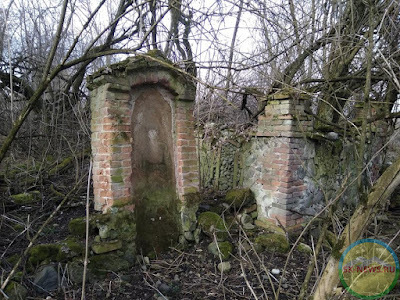 In 2006, an institute in Belgrade, charged with the protection of cultural monuments, offered to undertake maintenance of the site, but at that time it was not possible for the institute to enter the property to do technical research and measurements. 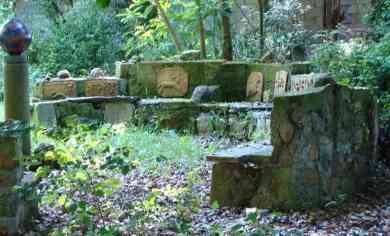 In all likelihood, in the years after the death of Živković, the garden was not or only irregularly open to visitors. However, the video from which the images in this article are derived, was released in 2016 on the occasion of the reopening of the site in that year. 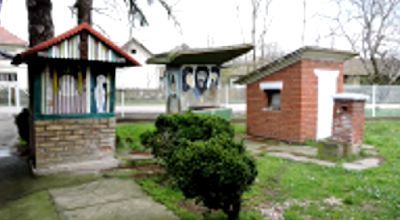 * Article (2017) on SCIndeks, the central site of scientific publications in Serbia, by Nada N. Živković. "The magic garden of Bogosav Živković in Leskovac- status and protection"
The picture above shows a creation named Map of the World under construction. 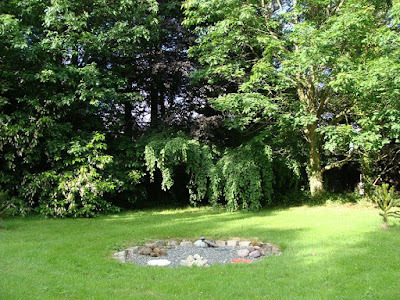 It is one of the cercles (circular thematic sites) included in Roselyne Descamps' decorated garden around the Villa Kernetra, which is located in the community of Lanvollon in Brittany, France. This cercle consists of a female statue surrounded by a circle of stones and benches on which a frieze will run with the twelve signs of the zodiac. another view of the "map of the world"
Born in May 1946, Roselyne Descamps studied at the University of Rennes, Brittany, and was educated as a botanist. She was a horticultural trainer at an employment pole in Guingamp and was conservator of the Kerdalo Gardens in Trédarzec. In 1978, when she was in her early thirties, she could buy Villa Kernetra in Lanvollon. 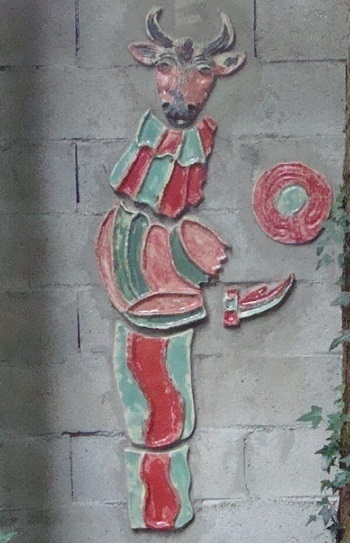 By this time Roselyne had also become skilled in making ceramics. Her qualities as botanist and ceramist, combined with a lively interest in myths, legends and tales of the Breton past, would have a major influence on her further life and the special development of the garden around Villa Kernetra. 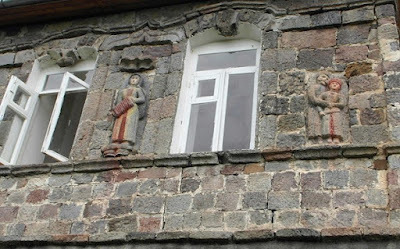 This villa was built in 1890 on a spot where in the seventh century a monastery -founded by an Irish monk- was located. 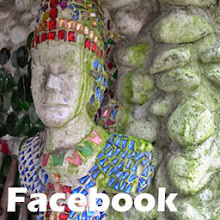 The garden of the property, over one hectare in size and separated from the street by a 40 meters long brick wall, was very suitable to realize Roselyne's idea to create a symbolic and thematic garden in the spirit of Niki de Saint Phalle's Tarot Garden, facteur Cheval's Palais Idéal or Robert Tatin's Musée. The garden was also transformed in botanically terms, for a part because of the damage caused by the great storm of 1987 that struck Brittany, but above all to give expression to contemplative and mythical concepts, reflected in special arrangements of trees and shrubs, such as the clairière des druides (clearing of the druids) -a collection of large trees in an arc- created in 1990-1992, a collection of hellebore under a weeping beech or palms and laurels planted in memory of the Templars and the cathedrals they built. 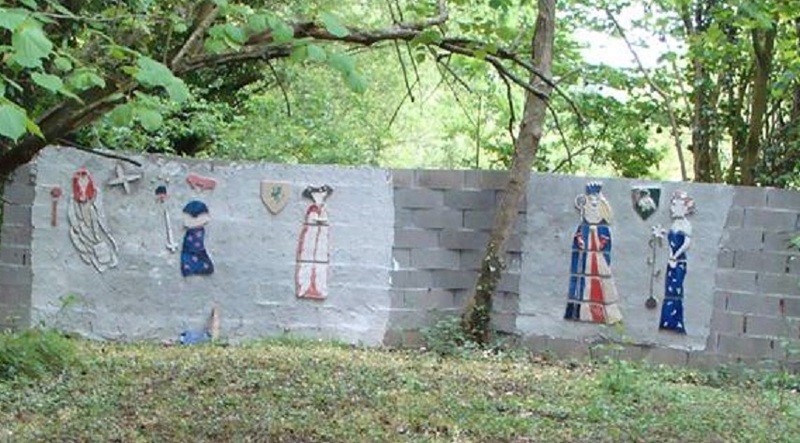 Assisted by volunteers, Roselyne Descamps from around 2011 until 2015 has been building a wall of about 70 meters long, made of white blocks of stone. This wall, which meanders through the garden and fits smoothly into it's landscape, is a decorative and -in sacral respect- a protective structure. In practical terms it offers the opportunity to fix the many mosaics that in the course of the years have been created to adorn the garden. Here is a small selection of these mosaics and other creations that decorate the garden. The picture above shows part of a group of all together nine Preuses Cavalières. Historically seen these are ladies, in general from aristocratic origin, who shared a chivalrous ideal and organized tournaments or formed part of military orders. 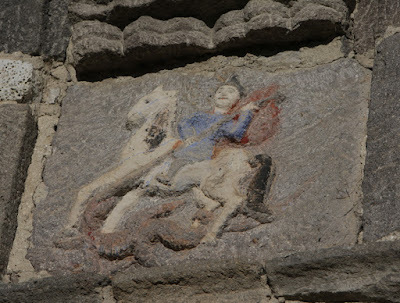 The scene is based upon an Italian wall painting in the Castello della Manta Museum near Saluzzo in the Piedmont region in Italy. On the wall of white blocks the visitor will see a large number of mosaics and frescoes of cards from the Tarot. 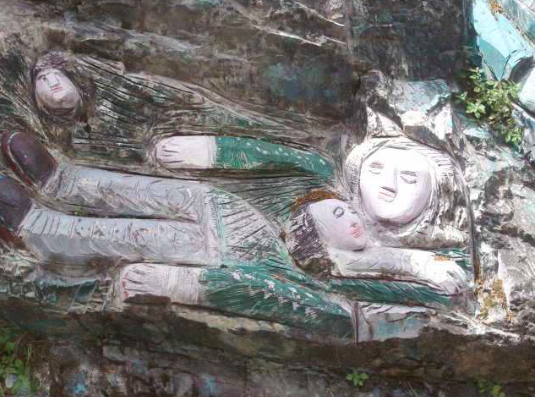 Above a a combination of dark blue mosaic made from sandstone, glazed at 1260°, representing card number 20, the Jugement. 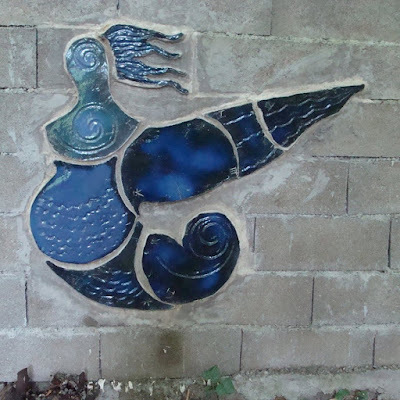 Left above the Zodiac sign Le Bélier (in English: Aries) created by Gérard Buissonnière, an artist from Paimpol. As it is the first astrological sign of the zodiac, Aries marks renewal and beginning. Right above the Egyptian deity Apis, in the shape of a bull with horns. Above a sculpture of Medusa, a monstrous appearance in Greek mythology with hair of winding snakes. 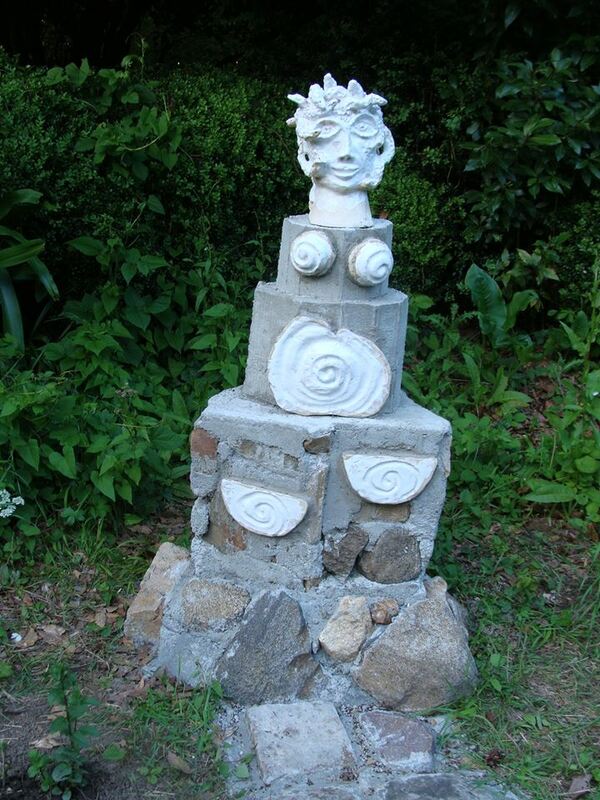 In the setting of the garden this creation also represents tarot card number 8, Justice. The above multicolored glass mosaic depicts a dragon, a creature that in the western world since the rise of Christendom represents evil and is synonymous with demons. Below a mosaic with blue elements depicting a tree. collection North Ossetian Art Museum M. Tuganova. North Ossetia is an autonomous republic within the Russian Federation, with more than 700,000 inhabitants. 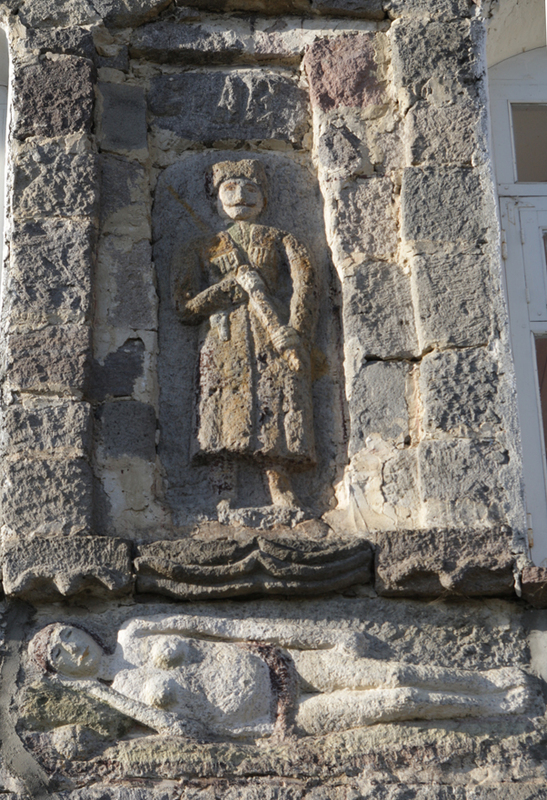 It is situated in the northern Caucasus, an area geographically seen as marking the border between Europe and Asia. In this area lived Soslanbek Mikhailovich Edziev (1865-1953), a well-known and appreciated self-taught artist, who initially only in his native region and meanwhile also in the Russian Federation has become known for his sculptures, carved rods and nicely shaped household objects, such as bowls. Edziev was born in the remote mountain village of Khod, some 70 km west of North Ossetia's capital Vladikavkaz. 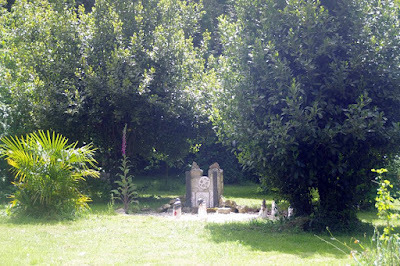 His father was a mason, who on the request of villagers would make gravestones. 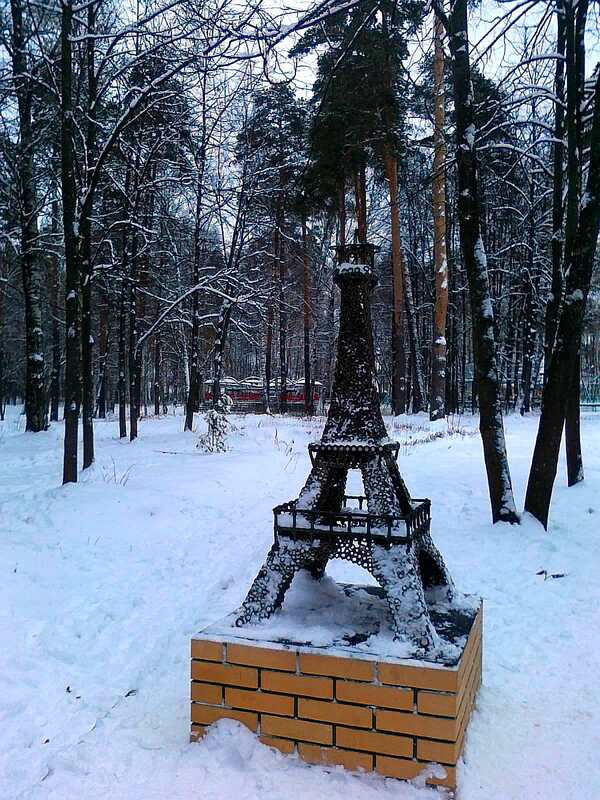 After his primary school, Edziev following in his father's footsteps also became a bricklayer. 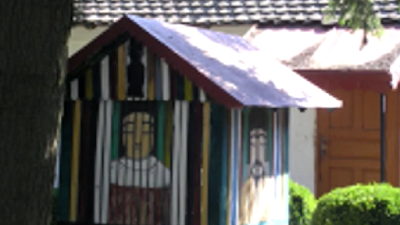 He also proved to have an artistic talent, which he developed over the years. In this community Edziev also built his own house of two floors. 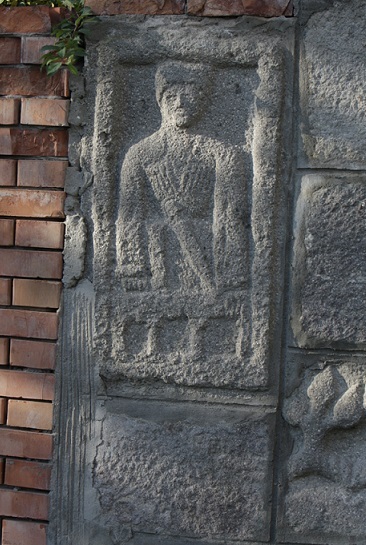 He married, got a son and would live in Karman-Sindzikau until his death in 1953. In the course of the years he became a productive self-taught artist. This post will focus upon Edziev's creative activities that can be associated with the field of art environments. That concerns the sculptures that decorate the walls of his house in Karman-Sindzikau, the grave tombs in this community and those in the village of Khod where he was born. 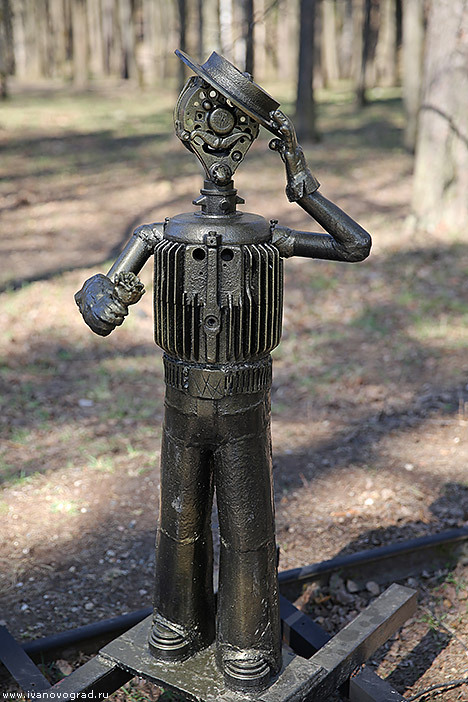 Edziev constructed his house around 1905, when he was 40 years old and he probably already had a lot of experience in making sculptures. 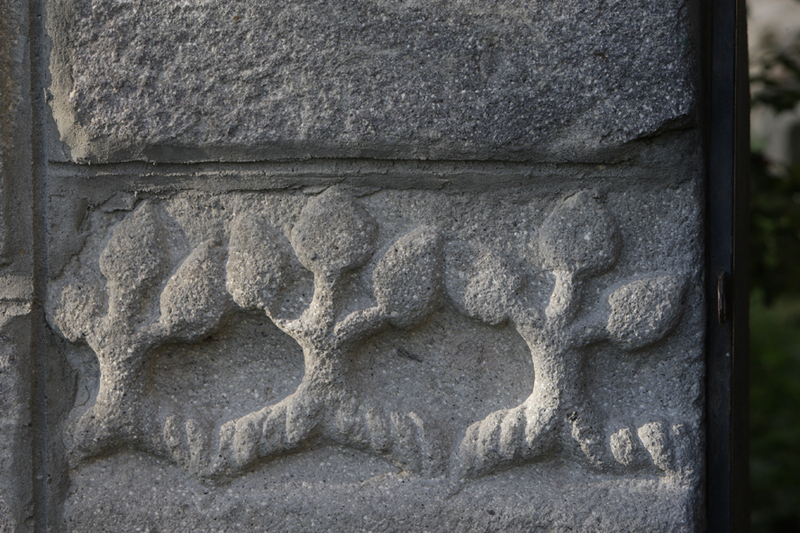 The sculptures on the outer wall mainly show individual people and a single couple, in any case there are no large ensembles. Currently Edziev's house is not inhabited and the sculptures probably have not been maintained for a long time, but some sculptures still have their paint and they seem to be in reasonable condition. In circles of lovers of Edziev's artwork it is being considered to transform the house into a museum. However, in this respect financing is a major problem. 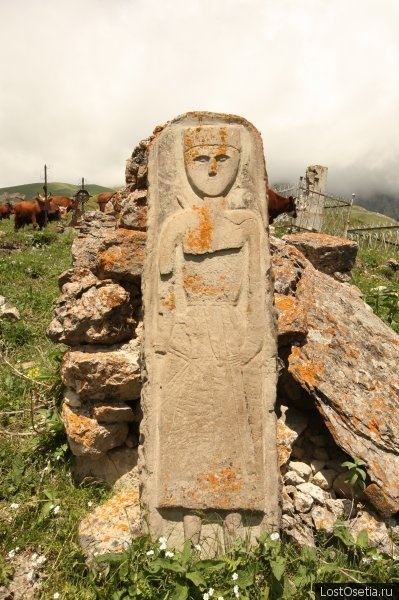 Traditionally, in North Ossetia a grave was provided with a tsyrt, kind of an obelisk. Edziev. 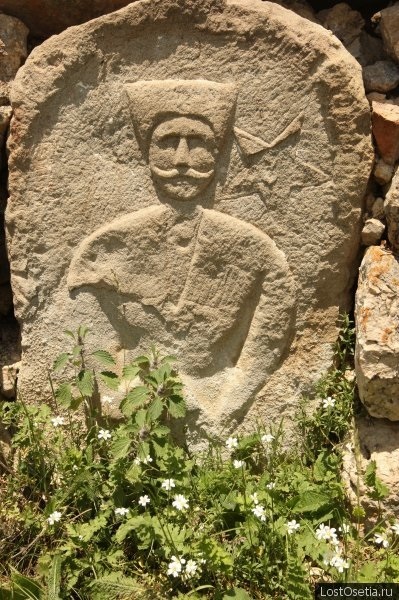 who has very often been asked to make a decoration for a grave, may be considered as a reformer of this tradition because he was one of the first to replace the tsyrt with a tombstone. 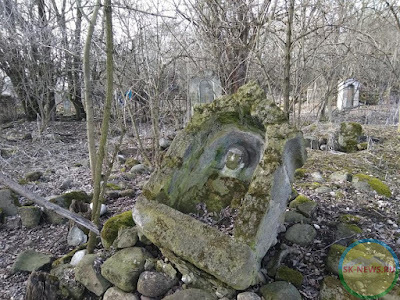 The internet has information about creations Edziev (in all probability) made for graveyards in his birthplace Khod and in his later residence Karman-Sindzikau, but also about tombstones on cemeteries in the communities of Nogkau and Zadatesk. 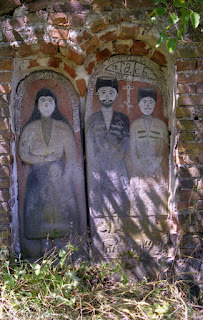 The graveyard in Khod has such a number of gravetombs created by Edziev, that this site ranks as an art environment. 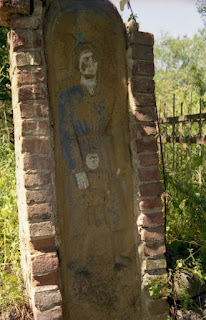 This probably also goes for the cemetery in Karman-Sindzikau. Characterizing the personality of the deceased corresponds to a certain extent to the work of Ion Stan Patras from Romania, who created grave signs for the cemetery in Sapanta. 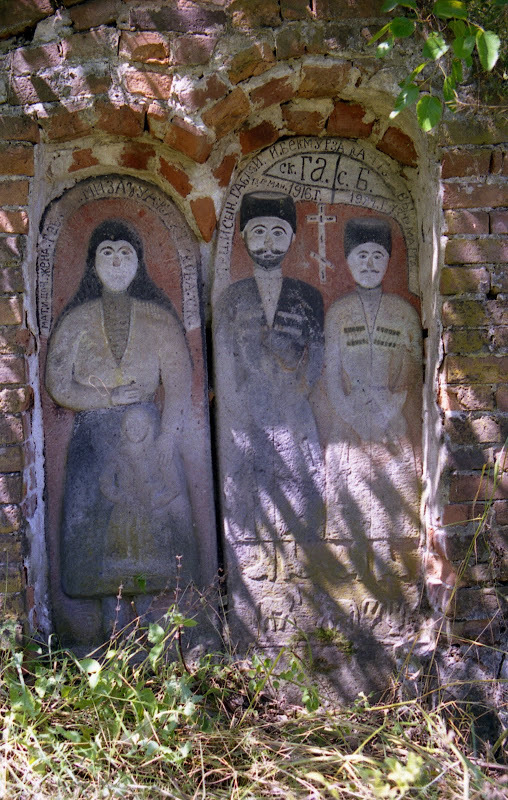 Unlike in Romania, Edziev's tombs are in danger of being lost if no protective measures are taken. But in this respect action is taken. In February 2018 a group of volunteers, among whom members of the Union of Artists of North Ossetia, cleared the cemetery of Karman-Sindzikau and removed shrubs that had grown over time around the tombs created by Edziev. In 1944 Edziev got formal national recognition when he received the title of honored artist of Ossetia. 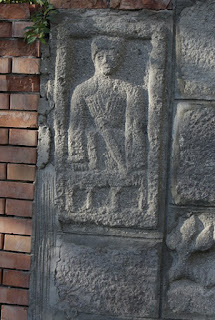 Maharbek Tuganov (1881-1952), an important person in the North Ossetian art world, in an early phase saw the importance of Edziev and encouraged the collection of his sculptures and wood works, in this way laying the foundation for the later collection of Edziev's artwork in the National Museum of North Ossetia Maharbek Tuganov In the 1970's this Museum would make efforts to identify and document Edziev's scattered graveyard sculptures. 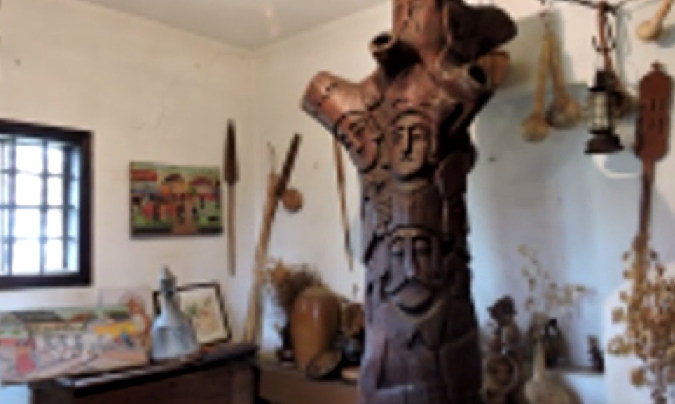 In 2015 the Museum had an exposition of Edziev's artwork on the occasion of his birth 150 years earlier At that time it was noted that Edziev could be seen as the forerunner of modern Ossetian sculpture. 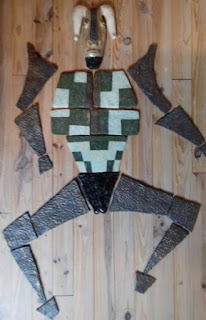 Edziev became known outside of North Ossetia, when in december 2016 the Moscow Museum of Contemporary Art had an exposition The Parallel of Two Legends about Edziev and Pirosmani (an artist from Georgia).